The first time I ate a cricket, it was on a dare. As was the second and third time. But once my friends realized it was a dare I would never lose, they gave up trying to gross me out with these creepy-crawlies. And that’s when things got really strange — long after the playful dares, I continued to eat them anyway. By then I was well aware of the endless nutritional and environmental factors, and frankly, I just like the crunchy, nutty, earthy flavour. The practice of eating insects is not a new phenomenon. According to a U.N. report, 80 per cent of the world’s countries eat bugs. 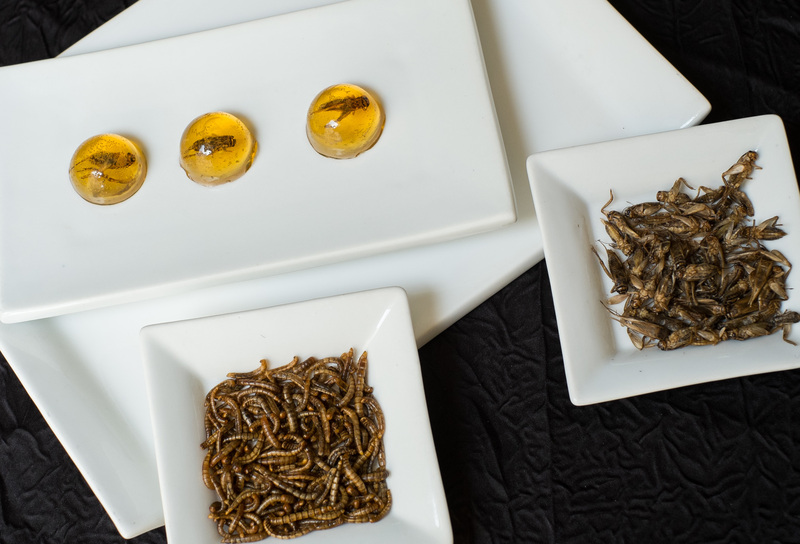 Still, entomophagy — the practice of eating bugs — is having a foodie movement. However, this is more than merely the latest foodie trend. According to Jarrod Goldin, co-founder of Entomo Farms, Ontario, “Given the dire situation of our current food and water crisis, and knowing this is only going to get worse as the population skyrockets to over 9 billion people by 2050, we hope to be part of the solution to bring protein alternatives to those who are unaware that there are alternatives,” he explains. Goldin and his co-founder brothers, Darren and Ryan Goldin, believe there needs to be a complete paradigm shift in the Western Hemisphere — a new way of thinking — not just about embracing entomophagy, but about being absolutely aware of “how our food choices directly affect not only our personal health, but the health of our planet. We have to start actually caring about this,” says Goldin. And he’s not the only one who sees the dire necessity for change. According to a 2013 report by United Nations Food and Agricultural Organization, the world’s food production will need to increase by 70 per cent in 2050 to meet the world’s rising population, and subsequently pointed to insects as being a sustainable food source. So, sure, the protein-rich alternative still has a few ick obstacles to tackle, but insect-eating seems to be equally good for health as well as for the planet. Goldin says that insects are the ultimate superfood, with twice the protein of beef, and they are rich in good fats. They also are a good source of calcium, iron and zinc. “Many companies are now using our cricket powder in their protein bars. They claim that cricket flour has more iron than beef, almost as much calcium as milk and is high in omega-3 fatty acids,” he said. Goldin explains that raising insects will ultimately slow the environmental degradation process. Crickets, for example, are so much more sustainable as a protein than beef is. A single cow can produce up to 132 pounds of methane a day, which is roughly equivalent to a car. A cricket, however, produces 80 times less methane than a cow does. Put another way, that means crickets need 12 times less feed than cattle do to produce the same amount of protein. Insects also take up virtually no physical space and can be fed on organic waste streams. A pretty good argument to put aside our aversion to bugs. Goldin suggests that newbies start by introducing cricket powder into their existing diet. When you bake or cook with cricket powder — which is actually just roasted crickets all ground up — anything you add to the cricket powder will have an added subtle, nutty flavor. Since it also provides nine essential amino acids and is loaded with B12, even if you start off by adding only a sprinkling of cricket powder, you’ll be adding important nutrients to your dishes. Slowly transitioning to the powder won’t affect the taste of your regular dishes, but you will still get the benefit of the added nutrients. For the braver set, you can just pop the entire insect — either roasted, plain or seasoned — into your mouth. Or indulge in an insect-rich fresh salad with a variety of bright veggies and a handful of dry-roasted waxworms thrown on top. This adds a delicious crunch to the salad without the gluten and other inflammatory properties of croutons. The whole-roasted insects are also delicious peppered onto a pizza, tossed into a taco or bundled into a burrito. More: Eating insects may be trendy, but these candy critters actually tempt us! And don’t worry about bug boredom setting in — all insects differ in nutritional content and flavor, and with over 1,000 edible insects currently known on the planet, we have over 1,000 flavors to choose from and enjoy!